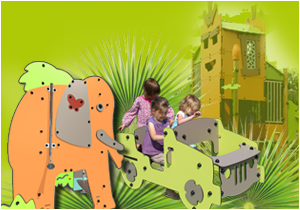 The Adventure themed equipment transports children into the leafy undergrowth of a jungle environment. Either aboard the jeep or by crossing the suspended bridge, the young explorers go in search of the secret temple. Along the way they will come in contact with a whole host of wonderful wild animals. Each of the structures comes complete with a wide range of play elements containing challenges to stimulate the senses.